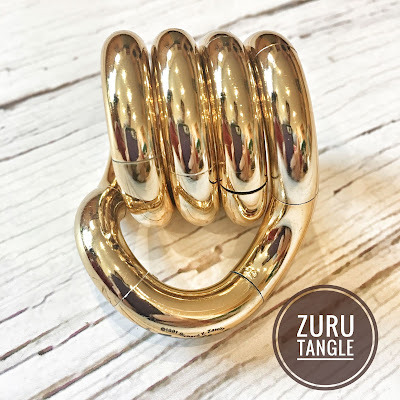 Today I want to share with you another great product that was included in my Blogon UK goodie bag; something relaxing, shiny and with multiple ways to play no matter what age do you have, the Zuru Tangle! Tangle is the original fidget toy, a pioneer in therapeutic brain tools for children and schools. The sensory and motor stimulation Tangle provides has been found to help stimulate and maintain attention, even improve math and reading comprehension. When I was young I bought one and it was always on my purse, I was always searching for it when I needed some inspiration or needed to relax my mind. The Zuru Tangle is a toy not recommended for children with less than 3 years old, because of the small parts, but as always, any type of toy should be supervised by an adult while the children play with them. I was lucky to have a Metallic Zuru Tangle, but there are 5 styles to choose; the classic, the crazy, the metallic, the sparkle and the wild. Which one is your favourite? My little one was a little too young to understand how to play with the Zuru Tangle, but he enjoys engaging and disengaging the parts! It is curious that when he doesn't know what to do, he always ask for it, it seems that it relaxes him! It is not easy to describe what is the Zuru Tangle, it has so many ways to play with it that you will need to try to play to discover what is your way to enjoy it!